We were in the right place! So your wife is ill in bed and daughter has a cough, yet you have tickets to Disney on Ice at the 02 which will crush your Disney Princess obsessed little one if you don’t go. What do you do?? I’ll tell you what I did, I left my wife in bed to get better, wrapped up my daughter nice and warm and headed out to the O2 early on Sunday morning. After a really pleasant train journey we arrived at North Greenwich with the O2 in the distance. As soon as we got close all the kids around us were dressed like every Disney Princess you can imagine. We were definitely in the right place. We walked into the O2 and were immediately in a queue where we got a programme the size of my daughter, a flower pen and a Disney on Ice bag (£13!?!). 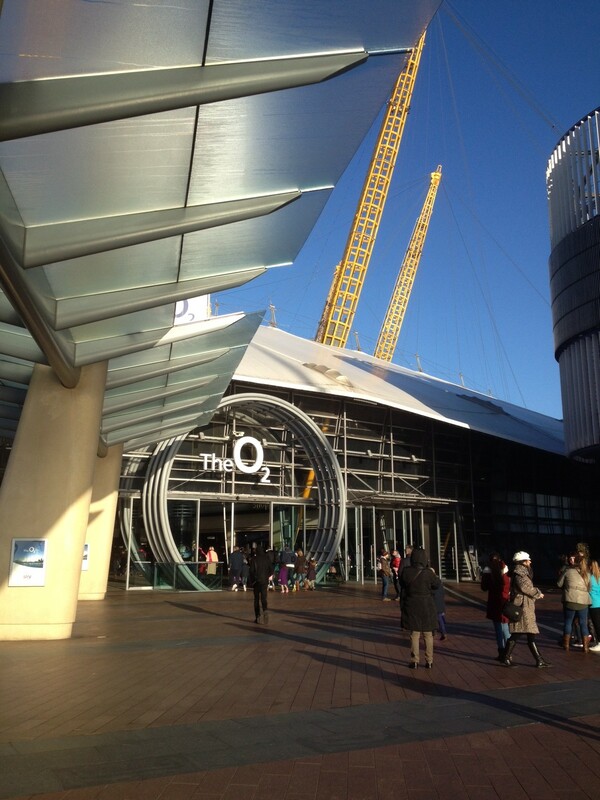 Thankfully we walked straight past the main merchandise stalls and headed into the O2 arena. The buggy park was only a few seating blocks from our seats and were given a ticket to collect it later. The seats themselves were eight rows from the ice and it meant we could see what was happening at either end of the rink. Block 102 is definitely the one to book. A few minutes before the show began, two people came out onto the ice with helicopter type boomerangs and were throwing them out into the crowd for them to fly back into their hands. My daughter is still talking about this like it was magic. The main show kicked off with the classic Disney gang of Mickey, Minnie, Goofy and Donald coming out onto the ice to introduce the colourful opener from “Princess and the Frog”. It settled us into the show and V was open mouthed throughout many of the jumps in the routine. Block 102 is the one to book! Next up was Snow White and the Seven Dwarfs which even had a competition winning family in a mine cart being pushed around the ice. The story was shortened to fit into 20 minutes but it had an amazing remote controlled magic mirror skating around the ice, poisoned apples and people in dwarf suits doing some amazing skating. What followed this was what we were really here for, Cinderella on Ice, and it didn’t disappoint. Up to this point V was sat back in her seat, transfixed on the ice, but the minute Cinderella started she sat forward and was in Disney heaven. From the slapstick routine of the ugly sisters, the dress-making mice, to the fairy godmother and flashing carriage and horses, it had everything she wanted and more. This took us into the interval full of excitement for the prince to find the girl who will fit the glass slipper. The 15 minute break, with a packed arena, was too short to do anything other than stay in our seats and discuss what we had just seen. The second half wrapped up Cinderella in the first 10 minutes and then the rest of the show was dedicated to the colourful world of Tangled. The Disney version of Rapunzel was jaw droppingly good and when Flynn and Rapunzel were flying around on her hair high above the crowds, I had to pick my daughter’s jaw up off the floor. It was a Disney memory she will never forget. I hope they do a version of new Disney film Frozen very soon. The whole segment ended with the classic lanterns scene that made us both think that the show couldn’t get any better. We were wrong. The final 10 minutes of the show has every Disney Princess and prince come out onto the ice to have a dance, accompanied by Mickey, Minnie, Goofy and Donald. There was a minor slip from one of the princes but he covered it up well! This was followed by fireworks!! This show is a must for anyone who loves their Disney. The two hour show flies by (literally at some points) and it was really entertaining. No thin ice to be seen, only top notch family entertainment. 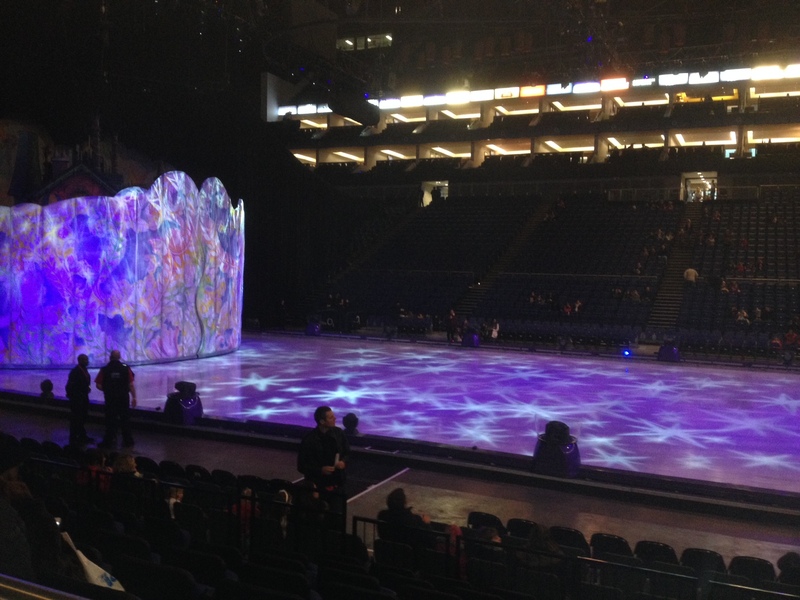 Yes, the tickets were pricey, coming to over £100 for two adults and a child but clearly you don’t see your favourite Disney characters ice skating every day. And it has made my daughter’s Christmas. This is without question the best experience I have had at the O2 to date and has made me think it’s a really great venue again. The queue to pick up the pushchair afterwards was quite short and only took 10 minutes. I picked up some merchandise on the way out. It was quite pricey but the show had won me over at that point! Great review, we are going on Saturday I am really excited now.